To order a printed copy of the Inghams Lakes and Mountains Summer brochure, simply click the Request button below. 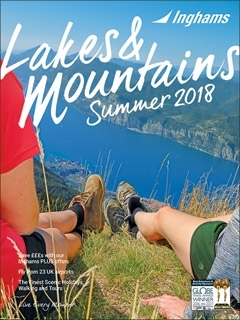 Inghams Lakes and Mountains Summer brochure features over 100 top resorts on the shores of Europe's most stunning lakes and fjords, plus the best loved mountain resorts. Now featuring Portugal; Lisbon, Setubal and Madeira!! Thousands of prices have been reduced and there is also a wide range of Inghams plus offers available, including save up to 800 pounds per couple. These run across the breadth of their entire programme and details can be found on the resort and hotel pages of the brochure. Request the Inghams Lakes and Mountains Summer Brochure today for inspiration on delightful summer getaways! Whether your passions lie in woodland walks, discovering new culture or relaxing by the beach, set your sights high and craft an ideal trip to Chichester and the surrounding areas. By pressing the Request Printed Brochure button you give consent to Inghams Lakes and Mountains Summer (and their Data Processors for the specific purpose of delivering your literature) to send you their Brochure .